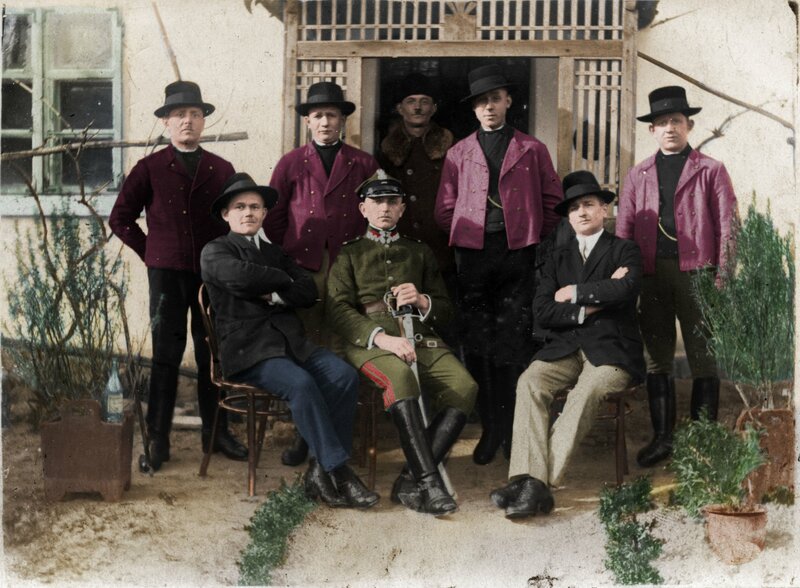 Fascinating scenes from weddings, christenings, harvests and religious processions from the early days of black and white photography have been vividly brought back to life in a new exhibition of colourised photos at the Ethnographic Museum in Poznań. Fifty of the museums oldest pictures from 1890 up to 1939 have been colourised for the first time and blown up to create an impressive gallery that demystifies the past and shows visitors how Poles lived and celebrated in the age before colour. 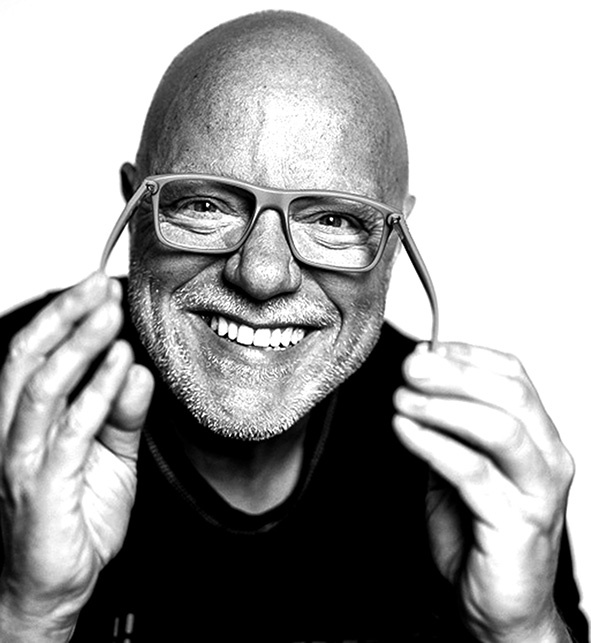 The identities of the those who feature in the painstakingly digitally retouched images remain a mystery, as do many of the locations and the photographers who took them. One scene shows a procession of traditionally dressed women leaving a church with an image of the Holy Mother with the baby Jesus held aloft. However, perhaps more fascinating are the women in the background wearing fashionable 1920s-style dresses and hats, who are all beaten in the headwear stakes by the nun to right of the procession with a very impressive wimple. 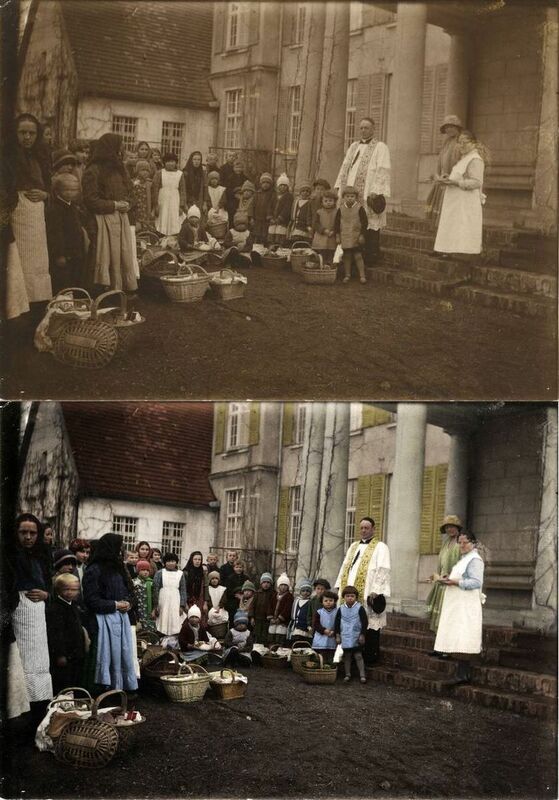 Another of the colourised images shows a scene of mainly children with Easter baskets, presumably after they were blessed by the priest in his vestments hovering over his flock. The children managed to remain still for the photographer, apart from the boy on the left, who charmingly lost patience and moved his head and appears to be looking in two directions at the same time. This detail highlights the much longer exposure times needed to ensure a well exposed image in the early days of photography. Exhibition curator Iwona Rosińska explained the concept behind colourising historical photographs: “Despite the fact that no picture perfectly reflects the true colours of people and their images, colourising black and white photos makes the story presented on them real, it updates the past and creates a document closer to the truth, showing clearly and tangibly the black and white world seen by the people who lived back then. “Archive photographs are often a mystery. Many pictures from the collection remain a puzzle; we don’t know who took them or where they were taken, and we know nothing about the people in them,” she added. Details abound in a group photo with musicians in the foreground. The boy peering over the shoulder of the double bass player is just one of many delightful children in the image. The mystery though is the man on the extreme right who appears to be pouring himself a drink above his head. 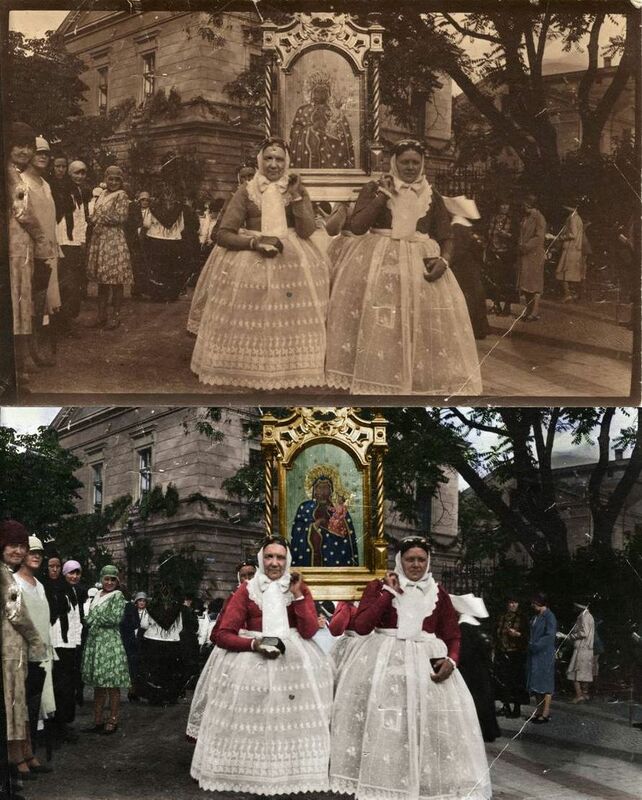 Due to the value of the original black and white photos and in order to protect them, only copies of them appear alongside their colourised equivalents. Cracks, scratches and damage in the originals were not repaired and all original technical defects were left. The photographs were then digitised and colourised digitally. They were given the colours that were probable for the place and time. The exhibition can be visited at the Ethnographic Museum in Poznań at ul. Grobla 25 until 30 June 2019.